A migrating rufous hummingbird flicks its long tongue. This female rufous hummingbird stays busy picking off aphids or sipping nectar. The male Anna’s has a deep red gorget that shows well in the sunlight. The female rufous hummingbird is greenish above and whitish below with rusty flanks. The green flecks on her throat are in rows. made its first appearance on March 9. Birding: The early hummingbird gets the nectar! Anna’s hummingbirds stay with us throughout the winter. It is a permanent resident so it is also here in the other seasons of the year. The rufous hummingbird, on the other hand, is rarely seen in the winter and only occasionally in the fall. A male rufous hummingbird in full breeding plumage made its first appearance of 2019 on March 9. It spent most of the day at the feeder or sitting on thin branches posing for photos! It was a challenging day for him. The Anna’s were not happy with the rufous hummingbird’s sudden appearance, nor was the rufous happy with the Anna’s presence. The current number at the feeder has been four Anna’s, three females and one male. All five hummers spent the day buzzing each other. Off and on they flew, but managing to get a few sips of nectar in between. The rufous made it clear that the feeder was his and that the Anna’s should just buzz off. He hogged it all day when he could. Is it possible, he is last year’s resident hummer and remembers this food source? They do remember so perhaps it is so. 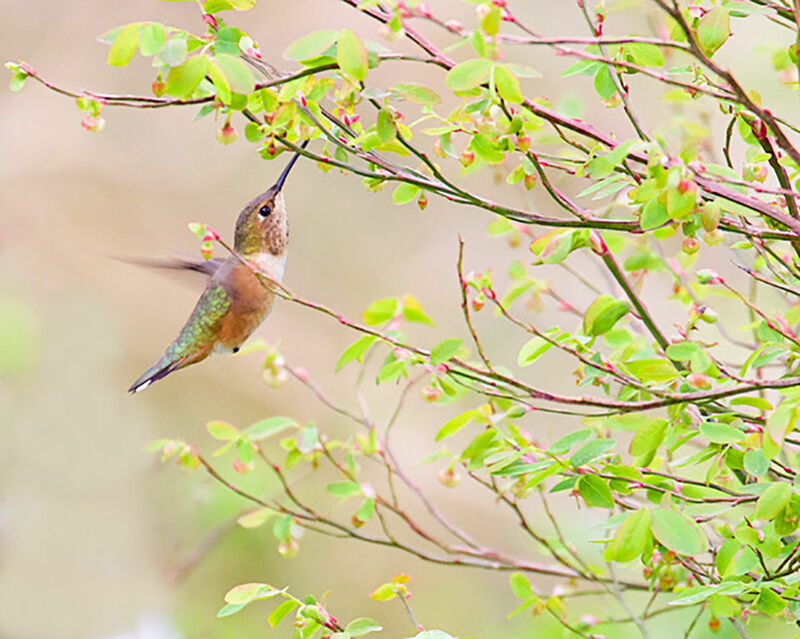 The rufous hummingbird is the most widespread of the hummingbirds in the Pacific Northwest, and they do reside in the same areas as other hummingbirds, including the Anna’s. 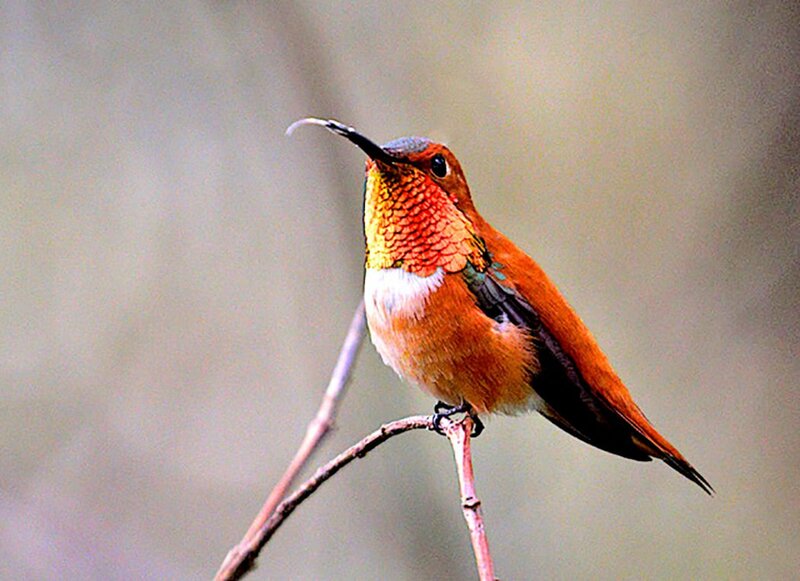 Scientists note that rufous hummingbirds do not like to share feeders! They can be very aggressive, and as I have already witnessed this week, the rufous will chase or attempt to chase other hummingbird species away. 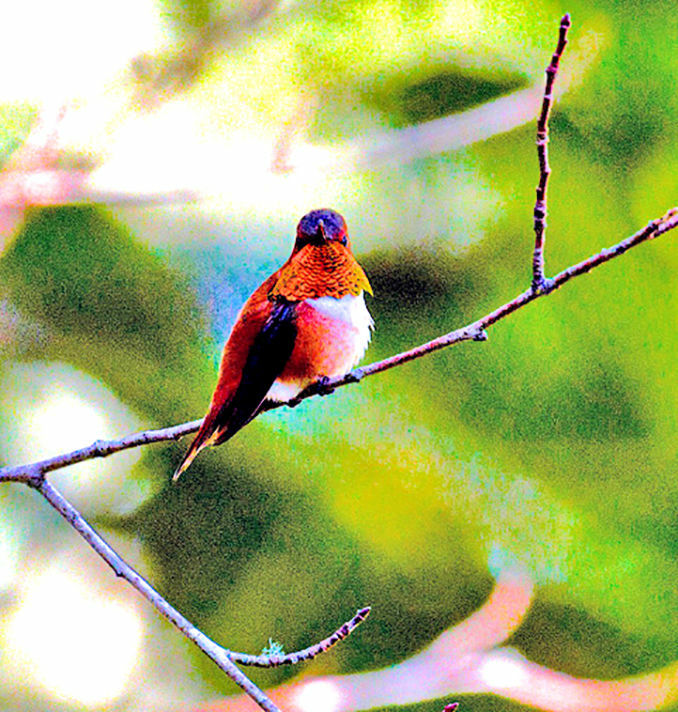 The male rufous hummingbird is easily recognized. It is a bright rusty orange overall with a few specks of green on its back. Its orange gorget shimmers in the sunlight. Depending on the light, the throat may also appear to be gold or greenish gold or even reddish. No matter what, it is a beautiful sight. The female rufous is green above and whitish below. Her flanks are a pale rust color and her throat is white with small green flecks. She is also a beauty to behold! There are two hummingbird feeders set up so that the birds at one feeder can’t see those at the other one. Both are used constantly. Now with the appearance of the rufous, last year’s feeder is the favorite of all the Anna’s and the rufous male. At the current rate, the feeder will have to be replenished every day! Guess I’ll have to hurry on over to Okie’s to stock up on white sugar! The recipe calls for one part sugar to three or four parts water. Bring to a boil, let it cool and it is ready to go! Keeping the feeders full with fresh nectar will help the hummingbirds get through the winter and early spring until their favorite flowers begin to bloom providing another access to nectar and the aphids, and until other insects, such as flies, midges and gnats, that are snatched from the air, are more readily available. Maybe having the two feeders will help these birds tolerate each other. Here’s hoping the Anna’s hummingbirds will select one of the feeders, while the rufous hummingbirds select the other. In any case, the presence and the beauty of these two hummingbird species will be watched with awe and appreciation throughout their stay!